Whether you are a foreign investor seeking a United States green card or a domestic developer sourcing capital for your latest project, the United States EB-5 visa program offers unique opportunity. In an industry known to be difficult to understand, The EB-5 Handbook breaks down the EB-5 program into its simple basics - investment, economic growth, and green cards. 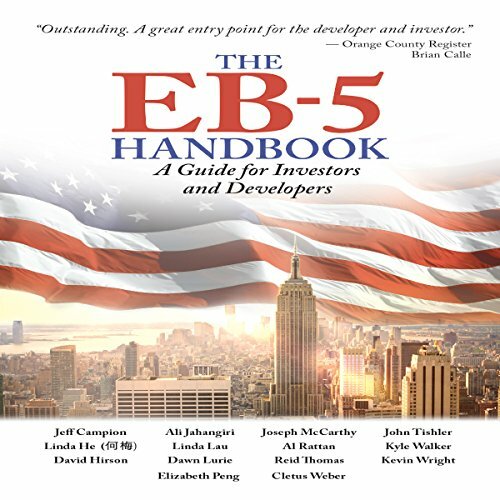 In The EB-5 Handbook, investors and developers alike will learn the essentials of the program, the benefits it can offer, and how to get started on their EB-5 journey with sections uniquely tailored to each party. Ali Jahangiri of EB5 Investors Magazine has brought together an all-star team of experts from nearly every segment of the industry. The authors - Jeff Campion, Linda He, David Hirson, Linda Lau, Dawn Lurie, Joseph McCarthy, Al Rattan, Reid Thomas, John Tishler, Kyle Walker, and Kevin Wright - and the editors, Elizabeth Peng and Cletus Weber, all have an established history of success working with EB-5 investors and developers. The EB-5 Handbook is the first of its kind to bring together such a diverse group of authors to increase transparency and knowledge of the EB-5 program. If you have any questions about this product by EB5 Investors Magazine, contact us by completing and submitting the form below. If you are looking for a specif part number, please include it with your message.